Skin care is the first and most essential step in helping to prevent premature aging of the skin. Maintaining good skin health slows aging and allows you to maximize the benefits received from other cosmetic treatments, such as a facelift, BOTOX® Cosmetic, or JUVÉDERM® and other fillers. Healthy, well-protected skin typically has better elasticity, stronger structure, and, most importantly, greater resistance to further aging. It is never too late to start a good skin care regimen. Comprehensive skin care should address every aspect of skin health: cleansing, correction of previous damage, stimulation of healthy skin cell regeneration, and protection of the healthy state of your skin. We have had excellent success with the Obagi® Nu-Derm Skin Health Restoration system, which has shown versatility in different skin types and stages of skin health. The Obagi® Nu-Derm System can be customized to help repair, treat, and maintain your skin to an optimal state of health. 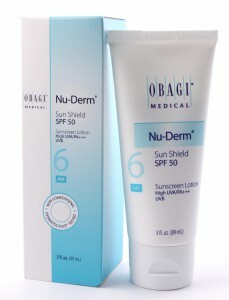 Obagi® Nu-Derm Sun Shield SPF 50 combines high UVB absorption and dynamic UVA blockage while providing an elegant matte finish. Non-whitening, PABA-free, and fragrance-free for all skin types.